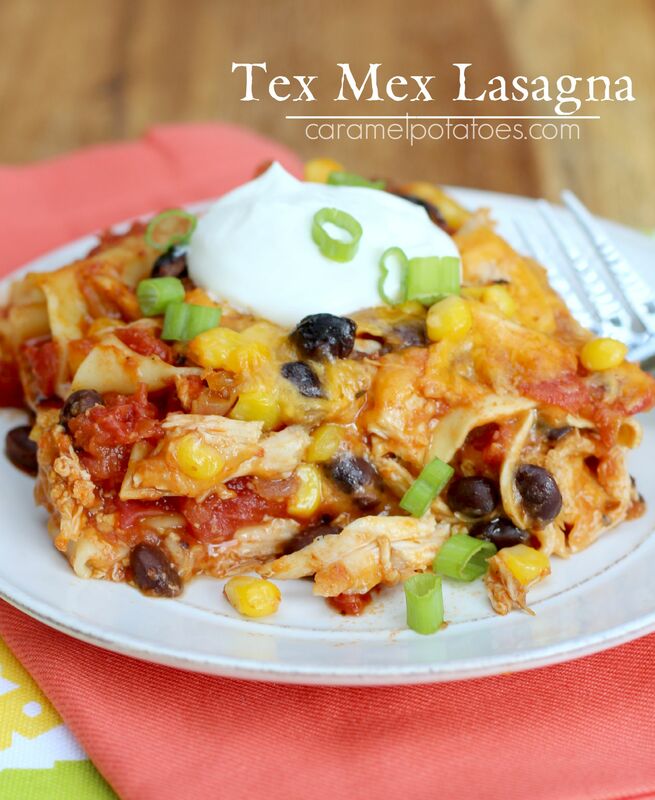 What could be better than combining two favorites – Tex Mex and Lasagna! 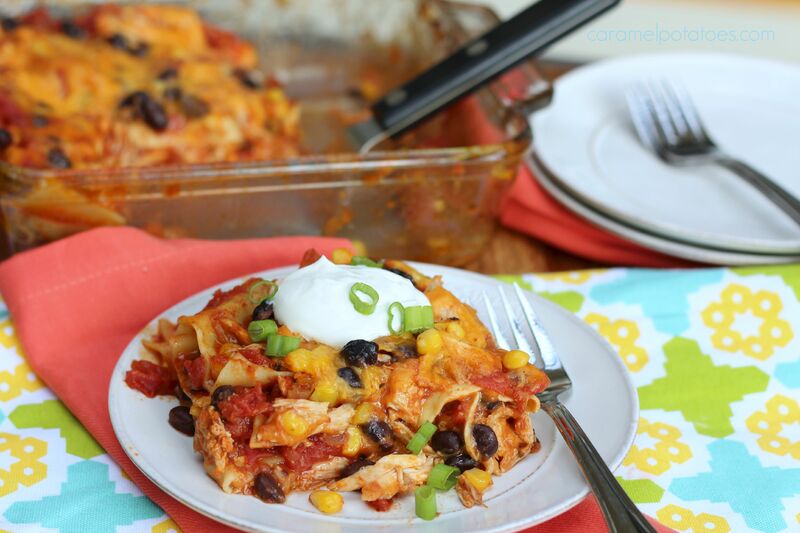 This Tex Mex Lasagna is so easy to put together and you can customize it to your own family tastes! 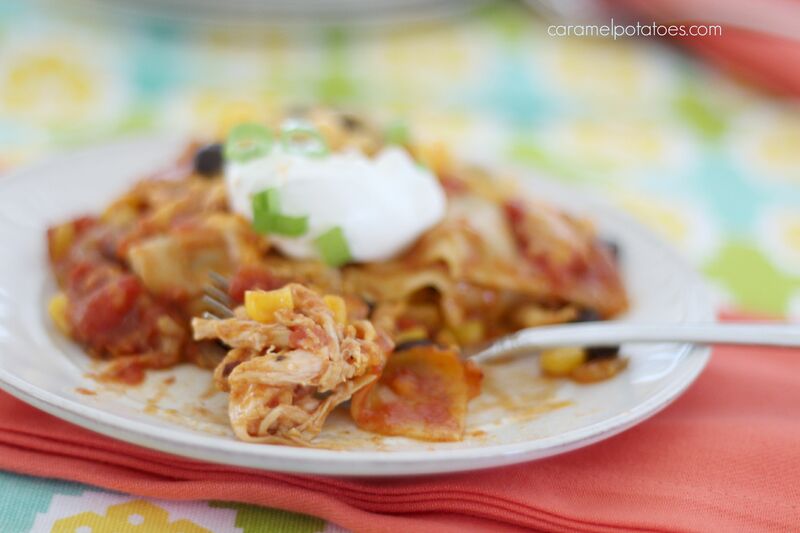 It combines oven-ready lasagna noodles layered with all your Tex Mex favorites – salsa, tomatoes, corn, beans, and gooey cheese. If you like add some diced bell pepper, cilantro, or jalapenos to turn up the heat. Your salsa choice can also add to the heat level. I like to use rotisserie chicken and serve it with sliced avocado on the side. If you prefer, you can easily substitute ground beef for the chicken (see note below). This is a great go-to weeknight meal and also makes a fabulous potluck favorite. Heat olive oil in a skillet and saute onion until tender. Add garlic and continue to cook for another minute or two. Add shredded chicken and sprinkle with taco seasoning. Mix until evenly coated. Remove from heat and set aside. Combine the salsa, diced tomatoes, tomato sauce, cumin, and chili powder in a bowl. Spread 2/3 cup sauce in the bottom of an 8-inch square baking dish coated with non-stick cooking spray. Arrange 2 noodles over sauce, top with 1/2 of the chicken, 1/2 cup corn, 1/2 cup beans and 3/4 cup of cheese. Repeat another layer only this time reserve a little chicken, corn and beans for the top of the lasagna. Place the last two noodles on the second layer, cover with reserved chicken, corn, and beans. Pour remaining sauce over the top and sprinkle with remaining cheese. Cover with foil and bake for 30 minutes. Remove foil and continue to cook uncovered another 5 minutes. Let stand 15 minutes before serving. Top each serving with a dollop of sour cream and green onions. *Can substitute 1 pound lean ground beef. Cook with onions and garlic, then add taco seasoning.